N.B. This shouldn't prevent a user from posting the question, just delay them a bit. Yes, this. Or something like it. 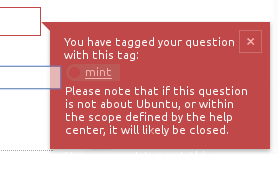 An off-topic warning that includes actual hyperlinks to sites where a question just about mint (or whatever distro) would be on-topic, would in my opinion be a good thing. At minimum they could be links to Unix.SE. Even better, for the most popular unofficial derivatives, would be to also include links their primary official support resources. But without such links, I think off-topic warnings would be a bad thing. 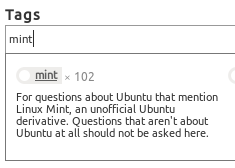 As long as it's easier to remove a few words (or tags) from a post to make it look like it's about Ubuntu when it's really not, than it is to go and post it in a better place, I think people will often do that instead of going to the appropriate support resources for their distro. It's bad when people post off-topic questions that are clearly about unsupported distros, but it only a little bit bad, because we close them and refer those people to the appropriate resources. This little bit of badness does add up, though, which is why measures like an off-topic warning with links would, I think, be good. We'll get more people asking questions about distros like Mint that we only discover are about unsupported distros when, say, something about that distro turns out to be the cause of the problem. Sometimes after extensive, time-consuming troubleshooting by volunteers in our community who are familiar with Ubuntu but may not be familiar with their real distro. Both those things are more than a little bit bad. In conclusion, this is a good idea, and so long as our off-topic warnings are made in such a way as to actually get people to go to the right place, that helps us and it helps their unofficial derivative distro also. Not the answer you're looking for? Browse other questions tagged discussion feature-request status-completed tags scope .